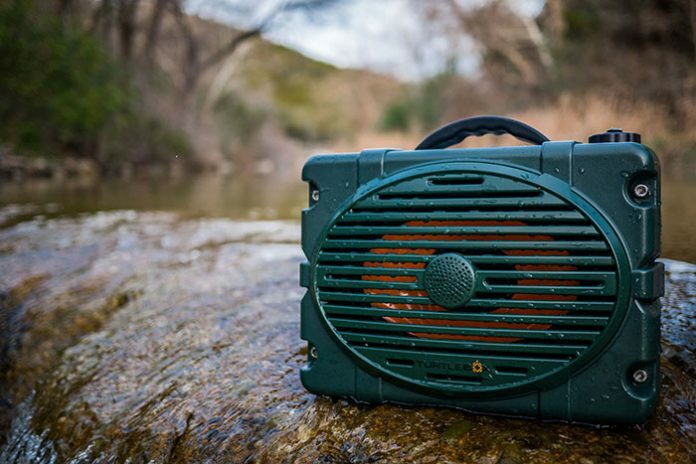 Turtlebox is a portable Bluetooth speaker with up to 120dB of distortion-free sound in a waterproof IP67 rated box. We already have portable speakers that only make sense when used indoors. What’s the point of labeling them as outdoor gadgets when we barely notice their output indoors? We want a gadget that when we choose to take outside, we shall be surrounded by powerful and big sound. Turtlebox plans to do just that. They packed a ruggedly shaped box that houses the world’s loudest Bluetooth speaker that you can use anywhere, anytime and anyway you like. What features make the Turtlebox worth the buck? First off, the unit is packed with an incredulously loud and super clear 50-watt amplifier. To top this off, there is an extremely efficient driver and speaker. This speaker will roar like nothing else you’ve heard. You will listen to all little tidbits of your music without any losses. Then there is the frequency range. The innovators equipped an accommodating frequency range to the device so that all minute details are projected loudly and clearly. The loudness rating of this beast is a cool 120 decibels. The company says that you will be able to pair two Turtlebox speakers wirelessly for true stereo sound. Unlike other systems that offer pretend stereo, with Turtlebox, the channels are clearly distinct and loud. Forgetting to mention that the Turtlebox will be waterproof, shockproof, dust-proof and powerfully durable would be denying it justice. It will take a beating, but keep playing, loud. The Turtlebox is seriously housed for the unpredictable outdoors. It is neither heavy nor lightweight but it’s tough without being shapeless. The box is built of stainless steel rendering it corrosion resistant in all types of environments whether salty or sandy. Its resistance to UV makes it hard to fade in the sun. There needs to be a balance between weight and size for sound to be delivered successfully. The Turtlebox weighs a mere 8 lbs. Turtlebox will feature a built-in 15,600 mAh battery that powers the loudest volume for almost 6 hours. If the volume is set at half, the power can last for more than 20 hours. There are so many portable speakers out there. Most of them are complicated and are certainly not made for the outdoors. Turtlebox looks like the perfect outdoor speaker. It is easy to use, and you will enjoy owning and carrying it around. As of this writing, Turtlebox is crowdfunding on Indiegogo.